The Long family has an impressive pedigree that has emerged (at relatively the same time as the Matthews clan) as quality players in the NFL. Following in the footsteps of his father Howie and his brother Chris, Jake chose to attend college at Michigan back in 2003. He was so highly touted, that Jake accepted the college offer before his Junior year of High School concluded. 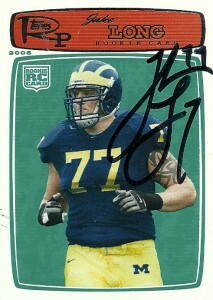 A consensus All-American in 2006 and 2007, Jake was drafted with the first overall pick of the 2008 draft by the hapless Miami Dolphins, and immediately became a fixture on the team’s offensive line at left tackle. Jake was to be the cornerstone to the team’s overhaul along the line, and started 61 consecutive games before a torn biceps sidelined him ending his 2011 season. Again in 2012, he landed on IR with a season ending injury. Due to his large contract, recent spate of injuries, and declining rating among starting tackles in the league, Jake was allowed to test the free agent waters in 2013. While the Dolphins did make a push to resign the venerable right tackle to a more cap friendly contract, the St. Louis Rams aggressively courted (with no less than 8 physicals) and signed him to a 4 year $34 million dollar contract, stunning the Dolphins. Long had a very good season blocking for the Rams, but in a week 16 contest against the Buccaneers, he tore both his ACL and MCL. Due to the seriousness of the injury, there is grave concern that Long will miss the entire 2014 season.